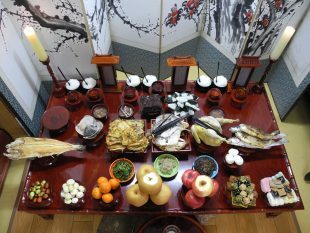 With the time-honored Chuseok holiday around the corner, there are new suggestions to update the traditional table set for the ceremony to pay tribute to ancestors. Cultural foundation Arumjigi is holding a display of those ideas. The display has three parts: ritual culture, ritual table and ritual cutlery. Korean families set up ritual tables during Chuseok. They believe dead ancestors’ ghosts come into the house to eat the foods on the table. The traditional holiday has been controversial over the years because women face the huge burden of preparing meals for all family members. The exhibition aims to reframe the concept of “Korean ritual” and “family,” reminding that Chuseok and ritual should be seen as a way to seek harmony between families rather than emphasizing the holiday’s formality. The exhibition’s opening ceremony, “Ancestral Rites for Modern Times,” will be held in the Arumjigi building in Jongno, downtown Seoul, Sept. 7. The exhibition will run to Nov. 2.